These hands-free binocular glasses will let you see literally everything you want to see, magnifying your view up to 3 times. You can use them to see clearly at the opera, concerts, sporting events or on nature outings. If you want to go to the opera but can’t actually afford a seat closer to the front, then these hands-free binoculars will allow you to see the stage without having to hold your arms and hands up for hours. The hands-free binoculars or Sportnoculars can also be worn by people with poor vision to watch TV. They allow for a 0+/-3 diopter adjustment without prescription glasses. 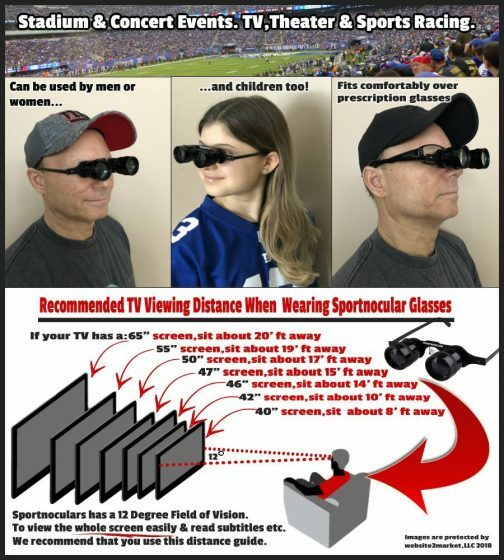 However if you require more magnification, you can also wear prescription glasses under the Sportnoculars. The hands-free binoculars have a precision optics feature and independently adjustable lenses: The sleek design allows the optical lenses to be spread wider or moved closer together. Sportnoculars have silicone nose and ear keepers so that you can feel more comfortable wearing them as well as keeping them safely on your head. The silicone ear keepers have to be worn to keep the hands-free binoculars securely on your head. This way you will make sure that the glasses will not fall off while you are cheering, walking or moving. They also have side shades, and a neck strap. The hands-free binoculars also have an aluminum frame which weighs under 2.5 ounces. 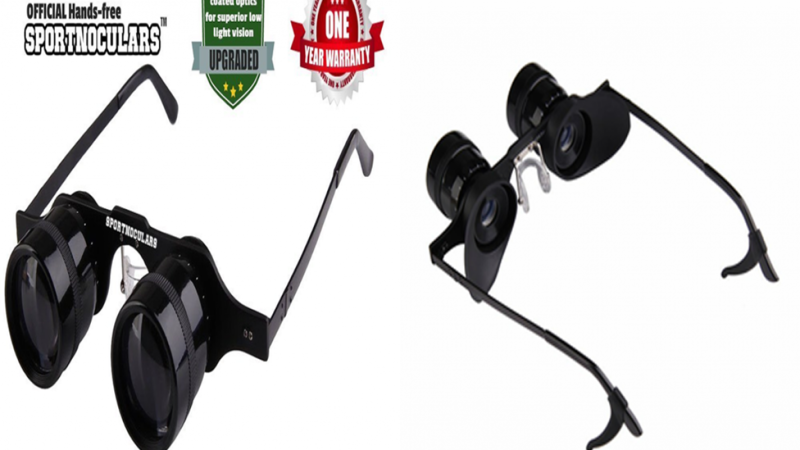 However users should be aware that the eyepieces and lenses themselves can be heavier. Available on Amazon: Sportnoculars OFFICIAL Hands-Free 3 x 34 mm Binocular Glasses for Sports,Concerts,Theater,Opera,TV Magnifiers,Fishing,Sight Seeing,Wildlife Observation,and so much more.